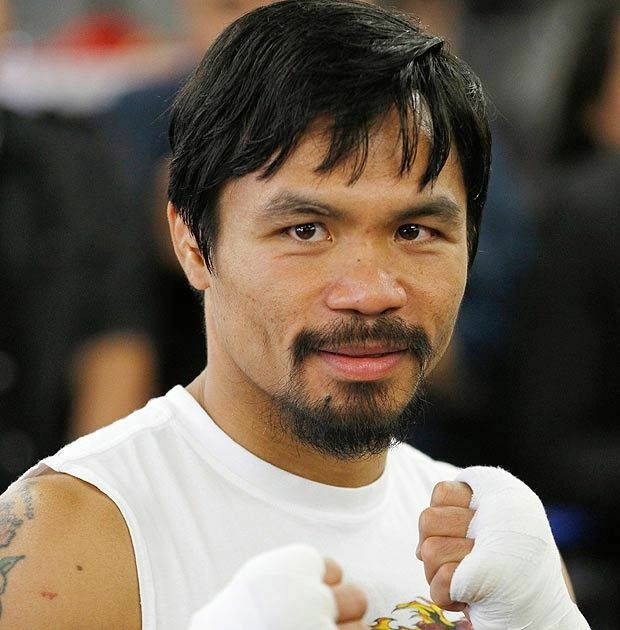 Manny Pacquiao is a Filipino professional boxer and politician, born December 17, 1978, in Bukidnon, Mindanao, Philippines, to Rosalio and Dionesia Dapidran-Pacquiao. Pacquiao is the first and the only eight-division boxing champion in the world, and is considered one of the world’s greatest boxers. He has won ten world titles in total and is also the first boxer who won lineal championships in four separate categories. He received the BWAA Fighter of the Year award in 2006, 2008 and 2009. In addition to boxing, he is also an actor, singer, a tv host, movie producer, businessman, a political candidate, and a founder of his own political party People’s Champ Movement, currently serving as a Senator of the Philippines. He married Maria Geraldine “Jinkee” Jamora in 2000, and they have five children: Mary Divine Grace, Emmanuel, Israel, Queen Elizabeth, and Michael. *He studied at Saavedra Saway Elementary School in General Santos City. *He is the first and the only eight-division boxing champion in the world. *His parents got divorced when he was in the sixth grade of school. *He dropped out of high school because he was extremely poor and left home at the age of 14. *He has been the first in Philippines to appear on a postage stamp as an athlete. *He has founded the ‘Manny Pacquiao Foundation’ to help the people of Philippines and other parts of the world who face problems like poverty and sickness. *He has also won the Best Fighter ESPY Award in 2009 and 2011. *He was named Fighter of the Decade for 2000-2010 by Boxing Writers Association of America. *He announced his retirement after winning his match against Tim Bradley. *Follow Pacquiao on Twitter, Facebook and Instagram.